Sometimes when you’re on the mountain you will hear something and think “what does that mean?”. Here is a list of some common terms to look out for so you don’t get stumped next time you’re skiing. All-Mountain Ski: A ski designed to perform well in all types of snow conditions at every speed, so if you like to ski powder and carve down the piste, this ski is perfect. 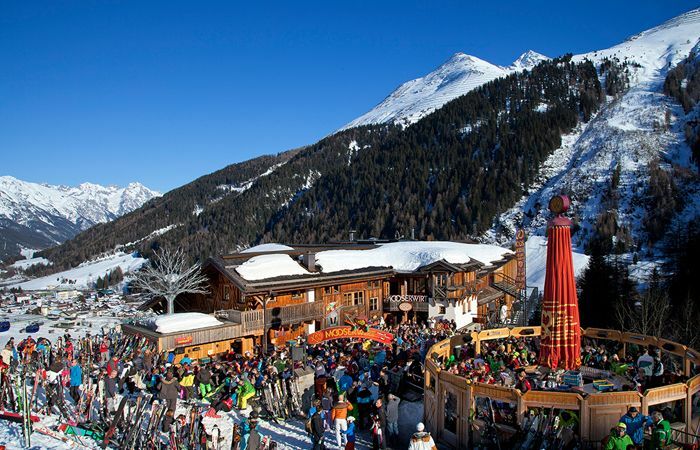 Après-ski: Translated as literally ‘after-ski’, Après-ski is the famous part of the day when the ski lifts shut and the pubs and bars amass with skiers looking for a thriving party or a quiet drink after a long day skiing. Backcountry: Also known as off-piste, Backcountry skiing is where the true ski-touring skiers and die-hard freeriders will spend their days. Dangerous for novices, this area of the mountain is reserved for those who are knowledgeable experts of the ski area they’re in. 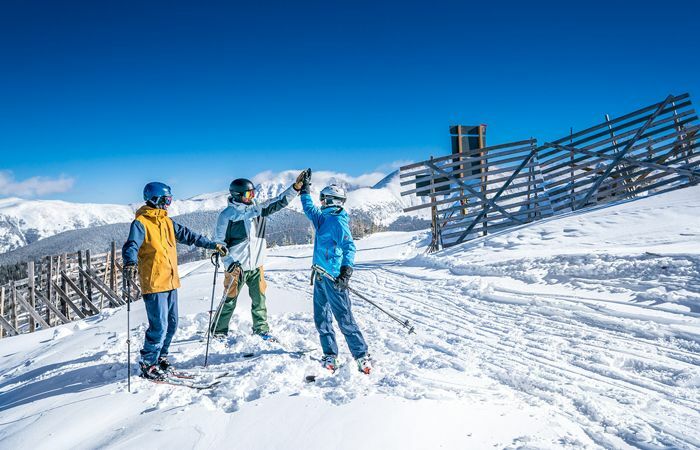 Blue run: The blue run is one of the lower-intermediate slopes that are not particularly steep; perfect for cruising and building up confidence on the slopes. Bluebird: A perfect day for skiing; sunshine and blue skies. Black run: The black run is the hardest type of slope you can find in Europe; advanced skiers will enjoy tackling these challenging slopes. Carving: Carving is the desired form of turning for skiers and snowboarders. By using the edges of your skis or snowboard you can perform a series of clean turns that create ‘S’ shapes and allow you to make turns without losing a lot of speed. Camber: Is the bend in the middle of ski that raises it off the ground, when you apply pressure to the camber of the ski it helps keep a good edge hold on the snow. Corduroy: When the slopes are groomed by the piste-bashers at night it gives them a neat combed effect which looks like corduroy trousers. Charcuterie: A selection of cured meats, often found in restaurants in the Alps. Crozets: Originally from the Tarentaise valley, Crozets are a speciality Savoie pasta. Diots: A speciality sausage from the Savoie region. Fall line: The fastest way/route down the mountain. First tracks: Being the first person to ski through a section of fresh snow. By being the first on the mountain in the morning it means you are entitled to the first tracks of the day. 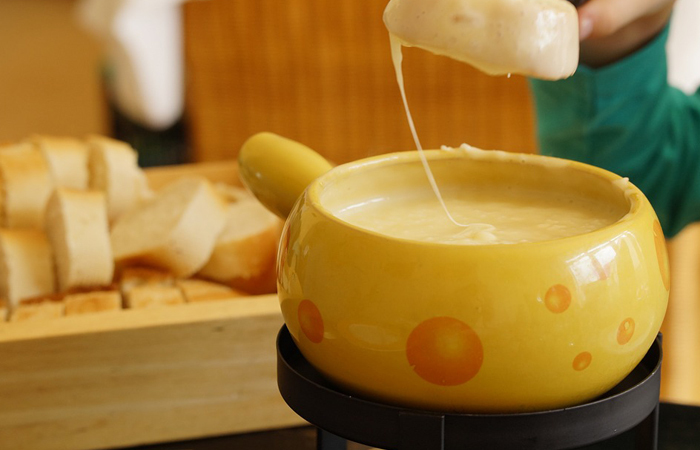 Fondue Savoyarde: The most popular Alpine dish on the mountain, typically made with a selection of cheeses (depending on where you are), white wine and kirsch. Freerider: Another name for a skier or snowboarder who prefers to ski mainly off-piste. Fun park: A dedicated area to freestyle, with plenty of jumps, rails and boxes. Genepi: A traditional herbal liquor and aperitif that is often found in the Alpine regions of Europe. Grooming: Piste-bashers groom the slopes in the evening to keep them well maintained. Glühwein: Also known as mulled-wine, Glühwein is a popular Alpine drink made with red wine and spices. Grappa: A popular, strong Italian spirit commonly found in the Italian Alps. Liftie: A shortened name for the ski lift operators. Line: Skiing a ‘line’ down the slopes is skiing a pre-planned route down the mountain. 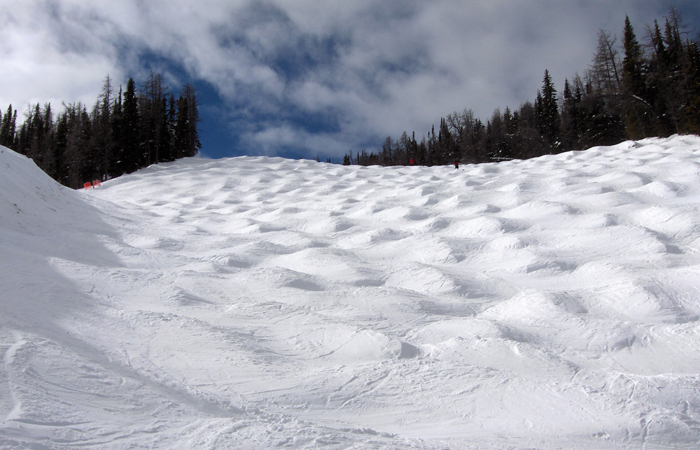 Moguls: Commonly found on steep blacks or un-groomed slopes; moguls look like a sheet of bumps on the slope. 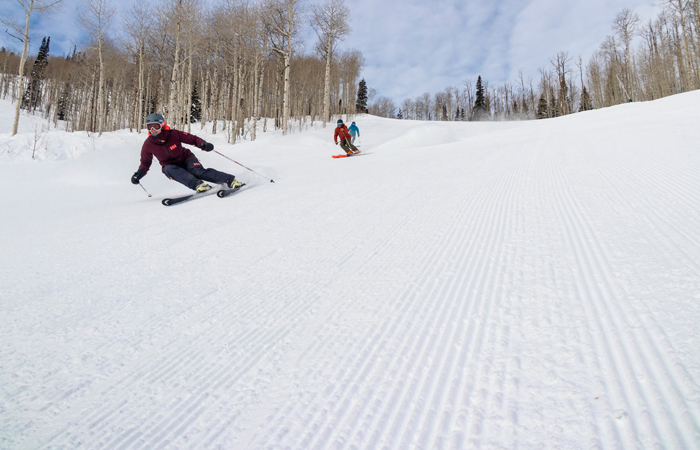 Nursery run: The easiest ski runs, reserved for those who are new to skiing. Planks: A slang name for a pair of skis. Poma: A beginners nightmare; also known as a drag lift, the Poma lift pulls you up the mountain by a seat that you put between your legs. 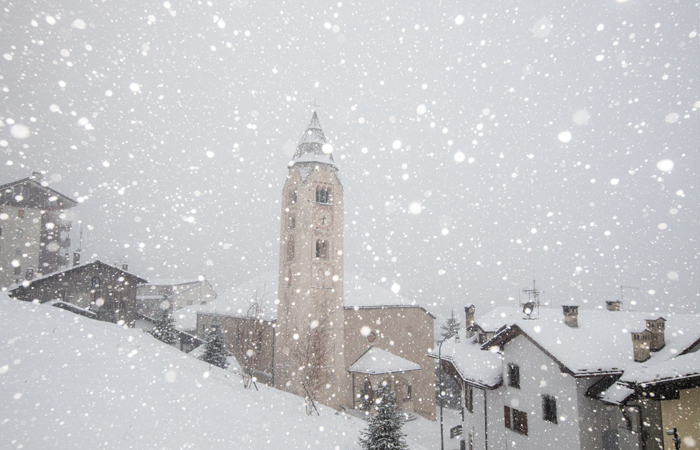 Pow: A shortened name for powder. Powder ski: A wide ski designed for skiing off-piste in deep powder. 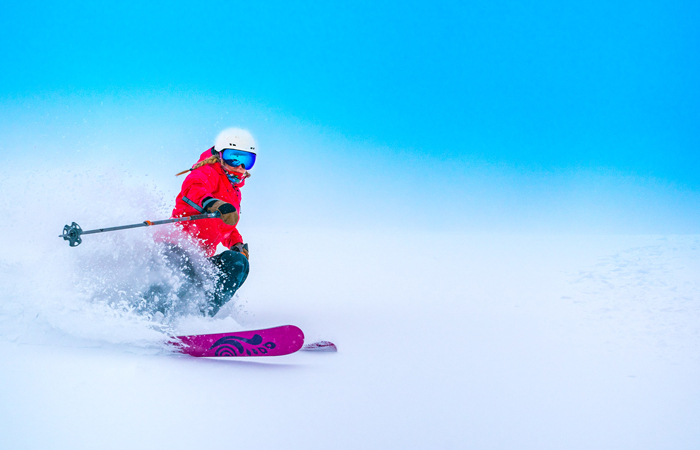 Race ski: A narrow ski designed for carving and performing well on the piste. Raclette: A popular dish in the Alps involving melted cheese and eating it with potatoes and other side dishes. Red run: A higher-intermediate to advanced slope that is steeper than a blue but not as steep as a black. Rocker: The rockered part of a ski is normally found at the tips and tails of a ski and is there for better floatation in powder. 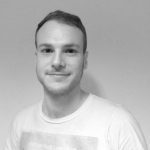 Seasonaire: A name for someone who works in a ski resort during the winter season. Sidecountry: Another name for skiing just ‘off the side’ of the piste, for those who want to dabble in off-piste skiing. Telemarking: A type of skiing that combines Alpine and Nordic skiing, the front part of your boot is connected to the binding but the heel is free. Traverse: The method of traversing involves skiing across the piste instead of straight down it. Tracked out: When multiple skiers have already skied through a section of snow; a freeriders worst nightmare. Tuck: The method of tucking on skis creates a more aerodynamic stance that allows you to go faster. Twin-tip: The name ‘twin-tip’ comes from the shape of the ski; both the tips and tails are turned up; popular with freestyle skiers and freeride skiers. Whiteout: Caused by bad weather, the flat lighting tends to make everything to look white. Now you know the jargon, you can head to the slopes with a bit more confidence. See our ski holidays here.